"Cullen, Harris, and Hill provide a clear and practical framework for addressing the root of the problems of today's universities. The authors provide a lucid, actionable, and evidence-based prescription for building an integrated learning system to replace the hodgepodge of miscellany that we have inherited. They illustrate the kind of conversations and transformations that could raise the value of and change the prospects for higher education." "This book offers a powerful, realistic, and much-needed plan for changing how learning happens in higher education. Anyone concerned about improving teaching and students' learning needs to read this book!" "To help achieve the imperative to make our universities more learner-centered, the authors focus on curriculum redesign and offer a solid theoretical approach combined with applied skills that institutional leaders and faculty can use to attain their goals. 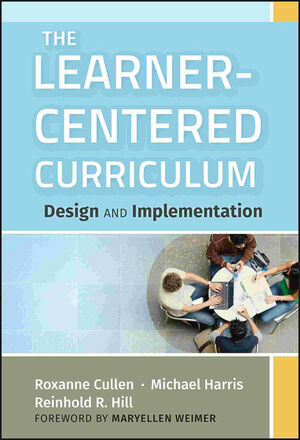 Shared governance, autonomous learning, assessment, technology, and physical space are among the elements discussed in this excellent book that universities will need to consider when developing a new curriculum that is more learner-centered." "Cullen, Harris, and Hill provide a thought-provoking resource with the compelling advantages and frameworks to create twenty-first-century student-centered, knowledge-centered, assessment-centered, and community-centered curriculum. This is a must-read for faculty and administrators committed to transforming their curriculum in order to educate better prepared graduates." "This is the book that I have been looking for. Written by three leaders who have done the heavy lifting of leading real change, it's a book for every academic leader who understands that innovation is essential to the future of higher education." Roxanne Cullen is a professor of English at Ferris State University in Big Rapids, Michigan, where she has also acted as associate vice president for academic affairs. Michael Harris is the chancellor of Indiana University-Kokomo. He and Roxanne Cullen coauthored Leading the Learner-Centered Campus: An Administrative Framework for Improving Student Learning Outcomes from Jossey-Bass. Reinhold R. Hill is dean of the College of Arts and Sciences at Governors State University in Illinois.